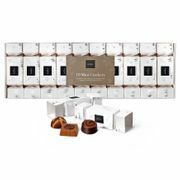 We have brought together the most excellent cheap Christmas crackers deals online so you can choose the best one to fit your budget. Voucher codes that can give you big savings are offered by various popular UK retailers. Take advantage of the latest deals, discount codes, and offers available online. Whether you are looking for any kind of Christmas crackers, never miss the opportunity to save more when you use voucher codes. You can definitely save as much as 70% when you buy from ASDA, B&M, Studio, and other UK sellers. AMAZON'S CHOICE for Christmas Crackers MAKE YOUR OWN" Cute Elf! John Lewis CHRISTMAS SHOP - One of the best! Studio Christmas Shop is Open! Find the best Christmas crackers sale from top retailers in the UK! Christmas crackers are an essential part of the holidays in the United Kingdom. In Australia, it is referred to as bon-bons. Aside from the UK, it is also common in countries like Canada, South Africa, and New Zealand. According to tradition, crackers were invented by Tom Smith of London in 1847. He created it to improve the bon-bon sweets he’s selling which were wrapped in a twist of paper. When the sales of bon-bons decline, he came up with crackers as new way of promoting it. Typical Christmas crackers are made of segmented cardboard tubes wrapped in colourful twist of paper that looks a lot like a sweet-wrapper. These festive gifts are normally found on each Christmas plate. When pulled, it’ll make a snapping or mild banging sound. Items such as a gift, party hat or toy will fall out from it. Crackers are said to be made of scratch. You only need tissue papers and empty toilet rolls. They are the answer to small personalised gifts that can be distributed on your guests. In Britain, Christmas Crackers are always found on dining tables with roast turkey. Once you open the cracker, you will see a paper crown made from a tissue paper. Afterwards, a joke on a paper will be found. These crackers have started from the Victorian times in the early 1850’s. It was London confectioner, Tom Smith who began the addition of motto to an almond bon-bon. Before, men would give them to women. This is one of the reasons why most mottos are love poems. Eventually, the addition of the ‘bang’ has been inspired. This happened after he heard sounds from the log he threw on the fire. This gave him the idea of making a log shaped package that has a surprise bang. That was the time when it was sold to Cosaque which will become the cracker known to the market. Caspari Alice in Wonderland Crackers Pack of 6. Yes, you can invite the cast of Alice in Wonderland at your Christmas party. Really this is a beautiful offering from Caspari. This features an Appliques illustration that has a crown, trinket and joke. The gifts have a mini whisk, playing card, among others. John Lewis & Partners Pine Cones Crackers Pack of 6. Available at John Lewis, this will give you a wintry feeling. Make this a part of your celebration too. 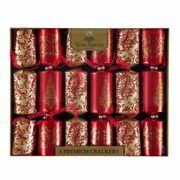 Fortnum & Mason Luxury Gold Wreath Crackers Pack of 6. These crackers are somehow fancy. However, if you have a budget, this should not be an issue at all. Invest on it if you must. This can impress your guests for sure. Robin Reed Victoria Santa Crackers Pack of 6. This will include a traditional touch to your Christmas. That happens thanks to the old-fashioned design waiting for you. Harrods Cocktail Christmas Crackers Pack of 6. These are said to be chic crackers. They are hand made with luxe velvet bows. This is not surprising knowing it is from Harrods. Since they are a little pricey, do not forget to find an affordable deal for this. 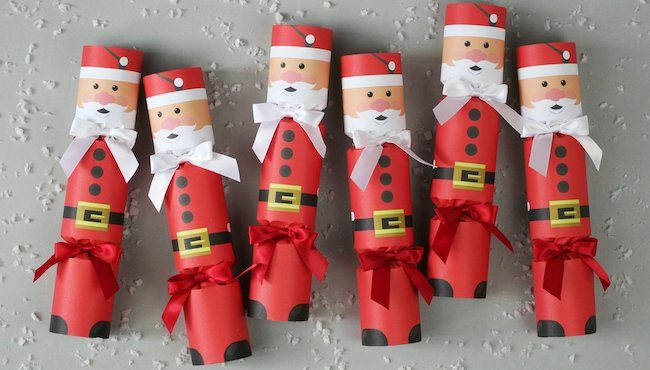 Spread happy energy during the holiday season with Christmas crackers. Here at Latest Deals, you will find discount Christmas crackers from reputable retailers across the country. Enjoy massive savings on Sainsburys, Home Bargains, Lidl, and Poundland Christmas crackers, as well as cheap Christmas Crackers ASDA offers. From bespoke and musical to high-end and unusual Christmas crackers, you’ll surely find a deal here that will not hurt your budget and will make your Christmas merrier. Our massive community of bargain hunters is always on the lookout to find the best possible Christmas Crackers sale, bargain offers, and price drops just for you. We also have a team of money-saving experts who regularly share essential shopping tips and tricks that can help you get some serious money off on your online and instore purchases for Poundland Christmas Crackers. Most UK retailers such as Amazon, TJ Hughes, Debenhams, B&M, eBay, Dunelm, and John Lewis among others, often have sale events, seasonal clearance, and flash sales where you can save as much as 60% off on a wide array of Christmas crackers. They also reduce their prices further during Black Friday, Cyber Monday, and Boxing Day. But if you want to maximise your savings, make sure to use the latest Christmas crackers discount codes available here. There are also voucher codes where you can get freebies and free shipping. Remember that the offers and deals we have here are are available for a limited time only, so make sure to grab opportunity right away once you spot a deal that you fancy. Also, do not forget to bookmark this page so that you will not miss out on any great deals from your favourite UK shops.